Hello lovelies! It's Kristin from BonBon Rose Girls. I'm thrilled to be here today sharing with you my idea of a perfect 4th of July BBQ look! 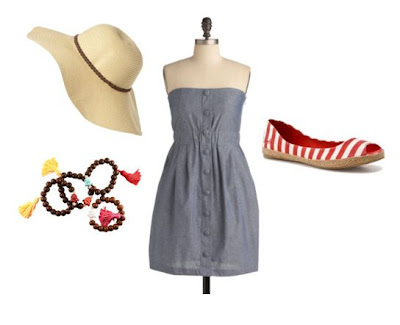 I'm a Florida girl, which means it's hot hot hot for me here on the 4th of July, so a little sundress and a floppy hat to keep the sun off my face would be clutch. Flat espadrilles would prevent any tripping just in case I'm tromping around in the grass and stacked bracelets are the perfect finishing touch! So, what will y'all be wearing this 4th of July? I'd love to hear what your idea of a perfect BBQ goin' outfit is! Ooh great job!! Love this for 4th of July. So fun and festive!! Cute outfit Kristin! Loving those shoes. Would have never thought of those. I like how its not over played. Really sophisticated. Love the choices! Especially the floppy hat!